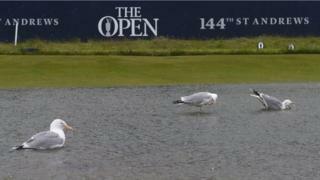 Round two of the Open Championship at St Andrews was delayed after heavy rain waterlogged the Old Course on Friday morning. Play got under way at 06:32 but was suspended shortly after as almost an inch of rain fell between 06:00 and 08:00 to leave the course unplayable. The weather gradually improved and the course was drained to ensure play resumed at 10:00 BST.